Abode Farm is Hiring for 2017! 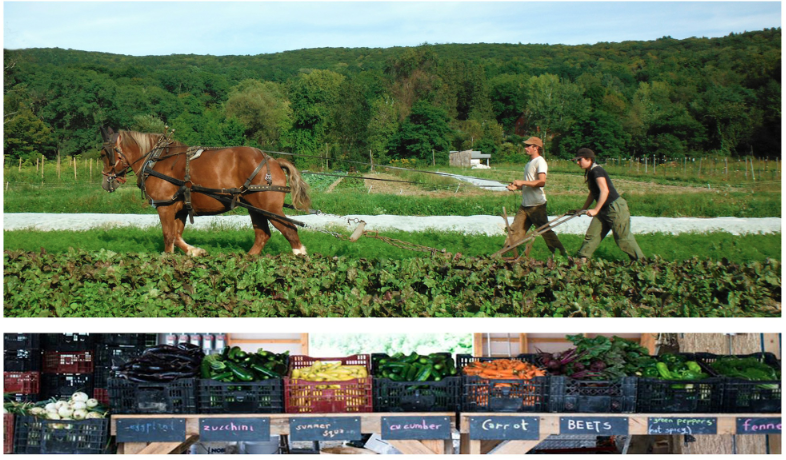 Abode Farm— is a cooperatively run 8-acre horse-powered farm in New Lebanon, NY. We produce vegetables, herbs, and flowers for our summer and winter CSA, wholesale accounts, schools, and farmers markets. Our farm is located on historic Mount Lebanon, a diverse ecological site; with wetlands, ponds, streams, woodlands, and meadows. We work to honor this diversity in our growing practices with a holistic farm system that builds soil, protects wildlife, and produces healthy crops. Practices— Our bio-extensive farm system focuses on diversity, cover cropping, composts, mineral amendments, and careful crop rotation. We do not use any synthetic fertilizers, herbicides, or pesticides on our farm. We rely on our Belgian draft horses as our primary source of power, which helps us stay light on the land, and sensitive to the biological rhythms we work with. We also use a small Farmall Cub tractor for bed-preparation and light tillage. Community— The farm is a dynamic educational and community space. We share our land with The Abode of the Message—a Sufi spiritual community, and Flying Deer Nature Center. It’s a busy place and there are always events going on. At the farm, we host many performances, workshops, potlucks, artists’ visits, and educational programs throughout the season. Community outreach and food access are extremely important to us. We are looking for someone who has an interest in community organizing, food justice, and education in addition to holistic agriculture. Full job description below the break! Our co-workers are involved in all aspects of the farm. We maintain 8-acres of vegetable and cover crop fields, 6-acres of pasture and multiple outlets for our produce. Our main focus is growing and distributing food for our 100+ member on-farm summer CSA and 80-member winter CSA. Tasks include greenhouse management, seedling care, seeding, planting, fieldwork, harvesting, occasional tractor work, and exposure to horse powered farming, draft horse care, rotational grazing, and grooming/harnessing. Co-workers will also be involved in farm planning, educational programs/workshops, community organizing, farm events, and more. We are looking for someone who is collaborative, outgoing, and excited to live in a small town and experience rural community life. Being both engaged and independent is essential, as you will have the opportunity to work on your own projects and need to be reliable, resourceful, and hardworking to balance a team-dynamic. We aim for a kind, collaborative, and largely non-hierarchical work place and need co-workers who are clear and strong communicators as well as grounded. We love a good sense of humor, attention to detail, sharp critical thinking skills, and passion! Previous farm experience and/or educational experience/community organizing are a plus! Please send your resume and a letter of interest to abodecsa@gmail.com, Thanks!